Do Your Servers Have Advanced Enlightenment? Businesses of all sizes are realising great benefits from virtualising their servers—saving money is always an easy decision! But server virtualisation also presents new challenges for small business specific to storage. Shared infrastructure is required to connect all resources and enable motion and mobility of applications. Historically only larger enterprises could afford the combination of SAN storage and enterprise virtualisation software to fully utilise mobility and high availability (HA) features. Citrix XenServer is a virtualisation platform that includes all of the critical features needed to deploy server virtualisation. Drobo® provides sophisticated data protection with BeyondRAID™ technology in a package that is easy-to-use and affordable. Businesses of all sizes are realising great benefits from virtualising their servers. Saving money is an easy decision, which has made deploying free versions of server virtualisation the most popular IT project these days, both for development and testing and in production. In addition to cost savings, virtualisation also offers great flexibility and availability benefits, which help IT managers maintain service levels for their business managers. These features, however, have not always been affordably priced in such a way that small businesses could use them in production. Server virtualisation also presents a new challenge for small businesses specific to storage. Shared infrastructure is required to connect all resources and enable motion and mobility of applications. Without shared storage, IT managers cannot move VMs within and between physical servers and thus cannot use the power of virtualisation to automatically move applications in the event of an issue. Historically only larger enterprises could afford the combination of SAN storage and enterprise virtualisation software to fully utilise mobility and high availability (HA) features. Affordable SAN and sever virtualisation solutions designed especially for SMBs. This combination makes for an architecture that enables tremendous flexibility. Business managers get the cost savings they needs, while IT managers can move applications as they wish without impacting user access or uptime. This is a lifesaver when it comes to maintenance—move a VM and application, perform maintenance, migrate back—and users never notice. This mobility can also be automated for a true HA solution and maximum uptime. Citrix XenServer is a virtualisation platform that includes all of the critical features needed to implement server virtualisation. Scalable for any size business, the low-cost Advanced Edition provides key HA and advanced management tools that take virtual infrastructure to the next level. Advanced Edition is priced at $1000 and appointed on a per server basis, upgradable via a license key with no additional software or downtime required. With Citrix XenServer Advanced Edition and iSCSI SAN, easy and affordable HA is possible for SMBs and enterprise departments. For more information on XenServer editions, see the comparison table @ http://www.citrix.com/ xenserver/how-it-works/editions. If not already done, configure network to enable communication between servers and storage. Recognise storage, finish storage configuration with XenServers and guest OSs. If running Free Edition of XenSever, non-disruptively upgrade to Advanced Edition. Use XenSever Tools to test and trigger XenMotion® and configure HA for automated failover. Support provided for Linux VMs that utilise paravirtualised (PV) drivers/kernel. 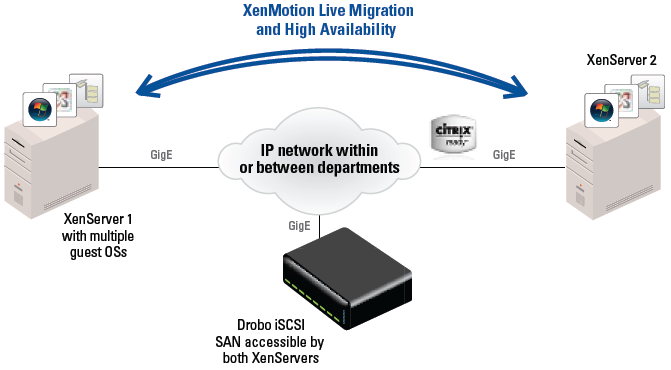 the HA capabilities of XenServer Advanced Edition connected to Drobo SAN via iSCSI. SAN storage is a must when you need to maximise mobility and availability for XenServer. Fibre Channel SANs have a high entry cost, which prevents companies with smaller environments and budgets from taking full advantage of XenServer. iSCSI can be lower in price, but many iSCSI arrays are still tens of thousands of dollars and expensive by most measures. Vendors claim that iSCSI arrays are easy to use and deploy, but most are built with large enterprises in mind. Drobo provides sophisticated data protection with BeyondRAID™ technology, in a package that is easy to use and affordable. Without the cost burden of storage built in, customers can experience the significant benefit of live migration between servers at a price they can afford. Applications for data protection can combine with this foundation solution for even higher levels of availability and recovery. Drobo means that there is one less barrier keeping you from reaching an enlightened Zen state of high availability for your applications with Citrix XenServer Advanced Edition.